THE JUNGALISS - a colorful spin on Bahamian slang used to refer to a gaudily-dressed woman with a rambunctious demeanor. The ingredients reflect the colorful nature of a Jungaliss through its unusual combination of Blueberry Mistic, Chocolate Dipped Potato Chips, Cookie Dough and Caramel Pearls. 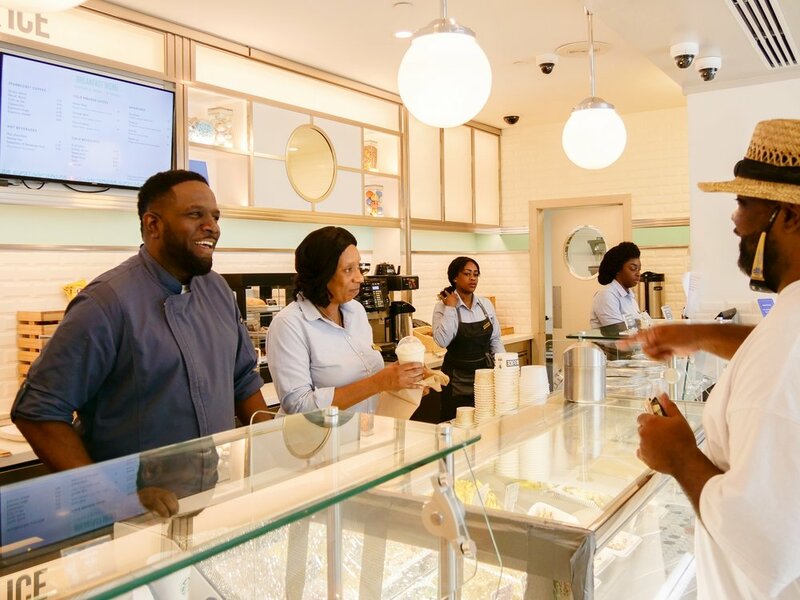 As the premier DMC in the Bahamas, we are always on the look out for the freshest talent, and you don't get much fresher than ice-cream visionary Chef Wayne of Sun & Ice - a trailblazing Bahamian ice-cream company specializing in "true-true" Bahamian flavours. Inspired by a colorful island culture and seasonal, locally-sourced ingredients, each flavour has a tale to tell. 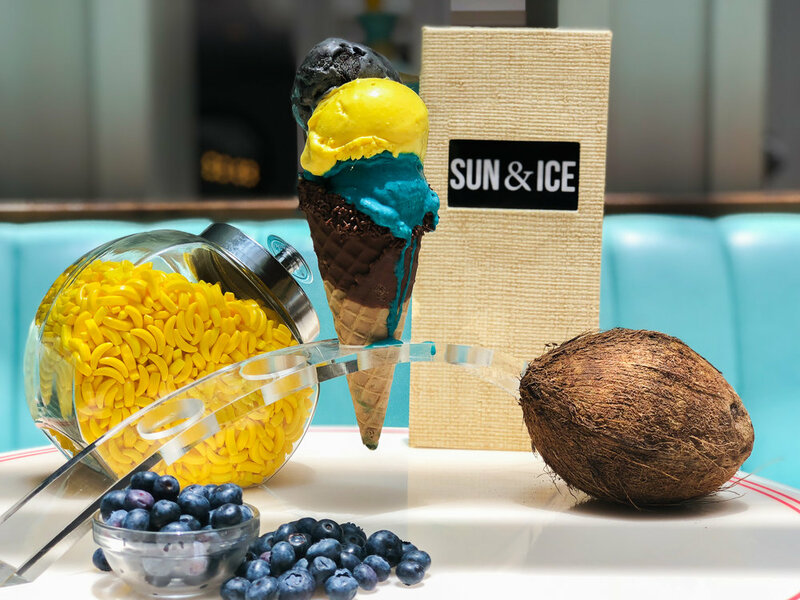 In this episode of #SavourCacique, we are thrilled to get the scoop on Chef Wayne of Sun & Ice - a gourmet ice cream parlor and the centerpiece of The Coral Towers lobby at Atlantis, Paradise Island. The parlor features unconventional organic Bahamian flavours, inspired by authentic Bahamian stories and intimate family moments. There is nothing like ice cream to lift your spirits, especially when it is made with true-true Bahamian ingredients and scoops of love. Chef Wayne sharing the love at Sun & Ice at The Coral, Atlantis. BOOKIE & BA RABBI - named after Bahamian folklore characters, this treat includes a blend of Pina Colada (Pineapple, coconut cream, and light rum), candied hibiscus, and citrus sorbet. Cacique: What inspired Sun & Ice? Wayne. Sun & Ice was created because I felt that it was my duty to assist in showcasing and celebrating the rich, unique, authentic food heritage and flavours of the Bahamas. My ultimate goal is to place the Bahamas on the global food map and to make Sun & Ice one of the top ice cream / gelato spots in the world. C. What inspires your flavours? W. Real stories and real experiences. The flavours are inspired by Bahamian culture and intimate moments spent with family. The fusion of authentic Bahamian culture and precious time spent in the kitchen with my mother, aunts and grandmothers heavily influences the design, aromas and tastes of Sun & Ice. I also love translating unique savory ingredients that I’ve used during my 26 years of culinary experience into ice creams, gelatos and sorbets for a unique spin on typically sweet treat. Cacique. Where do you source your ingredients? W. We source our ingredients from local farmers markets in Nassau and on the family islands (Cat Island and Eleuthera). We occasionally source fresh items from street vendors in Nassau and from Potters Cay Dock farmers markets. C. "What makes your ice cream different from other brands? W. The quality of the ingredients and uniqueness of the flavours. Our ice cream, gelatos and sorbets are handcrafted and seasonal. The flavour combinations are Bahamian inspired, unconventional and exotic; they are fun and guided by professionally-trained and experienced chefs. C. How does ice cream make you feel? How does it makes others feel? BAHAMA ROCK - featuring the bold colours of the Bahamian flag. W. Like sunshine on a rainy day. In a magical way, It uplifts your spirit. Like a celebration. It brings family, friends and that special love in your life together. When our guests eat our ice cream, their mood is instantly uplifted. Positive energy noticeably reigns; families, couples and friends becomes happier. It acts as a soother and comforter on a hot day in The Bahamas. C. Why do you love what you do? W. Because I am living my life purpose. Using the gift that God blessed me with. I love being a food ambassador for the Bahamas. I have the highest respect for ingredients and the authenticity of Bahamian food and recipes. I always aspire to tell the Bahamian story through ice cream, gelato and sorbet - putting true Bahamian culture and heritage in a cup or cone and sharing it globally. C. What are the names of a few popular flavours and what are they inspired by? W. The Dorothy ( Sea Grape, Vanilla, Cherry) is inspired by my mother's first name and her favorite ice-cream flavor from the famous Howard Johnson Ice Cream Parlour in the old Nassau Beach Hotel that we often visited when I was a child. YEAH BEY - Meaning "I love it!" was inspired by Chef Wayne's wife's reaction when she tasted it for the first time. 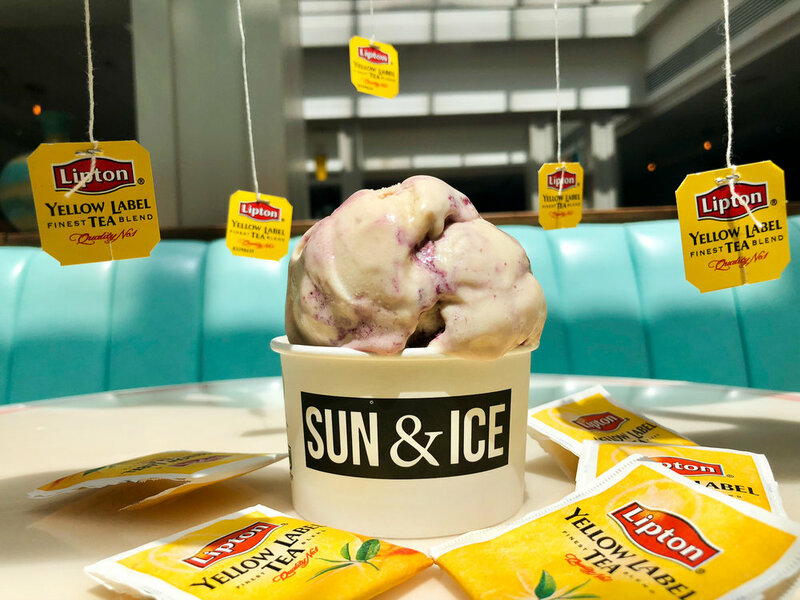 The Yeah Bey (Soursop, Caramelized Sugar Banana) - The flavors were Inspired by Soursop Juice, which is a Bahamian favorite made of a mixture of Soursop juice, sugar and cream. I then decided to pair this blend with Sugar Banana (which is another local delicacy) to shake things up a bit. The name was inspired by my wife's reaction to the first batch that I whipped up; when she tasted it her first reaction was “YES, I love it!” , so I decided to name it “Yeah Bey” which in Bahamian vernacular is equivalent to her response. The Auntie Mar (Guava Duff) - Inspired by my Auntie Persis who insisted that her nieces and nephews called her Mar after she visited England. She gave me my first authentic Bahamian Guava Duff experience and I will never forget the rich aromas of the organic guavas that reminded me of a sweet perfume. The Junkanoo Gelato (Red Velvet, Rainbow Cream Cheese, Oreo) - The colors and flavors are Inspired by the vibrancy of Junkanoo (traditional Bahamian street parade). There is a certain energy that comes with Junkanoo and this is incorporated into every bite. BAHAMIAN TEA & BREAD - A flavour stepped in Bahamian tradition that includes Lipton Tea, Croissants with Blackberry & Pineapple Jam. C. Do you have a favourite flavour? If so, what inspires it? W. Because I am such a chocolate lover. The Well Muddoes (double chocolate brownie) will be the one. It is rich, velvety, creamy, chocolaty goodness. Trust me, it really makes you say "Well Muddoes"! C. What's the most unconventional flavour? W. Peas & Rice - Chickpeas, Coconut, Chocolate Chip Cookie Dough & Rice Krispies. C. Are there any new ventures on your horizon? W. Work is in progress for second location on the Island of New Providence. C. Lovely, we look forward to seeing Sun & Ice continue to shine and put smiles on your guests' faces. Until next time! W. Yeah Bey, Catch you later. Here at Cacique, we love to push boundaries - be it through art, music, design or culinary experiences. That is why we are always on the look out for fresh new talent, like Chef Wayne and his cool delights at Sun & Ice. For enquiries about Cacique Culinary Experiences - tailor-made to wow the most discerning of palettes - please feel free to contact us.